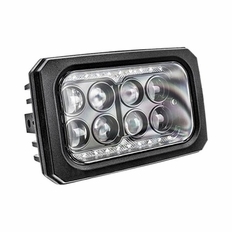 Oracle LED 4" x 6" (4x6) Headlights are the perfect addition to your vehicle. Featuring 15 3 watt USA Made CREE LEDs per assembly, they light up the road (2200 lumens per assembly pow beam 4400 lumens high beam). These are a great solution to replace dull and ugly 4x6 sealed beam bulbs.